Home » Accessories & Terrain » Are Cigar Box Battles UK rock music fans? Are Cigar Box Battles UK rock music fans? One of the constant dangers of taking photos of wargaming tables is the dreaded “wargamer’s crotch” – where the background of a picture is spoiled due to the proximity of a player’s lower body…because wargames tables always seem to be at that height, don’t they? 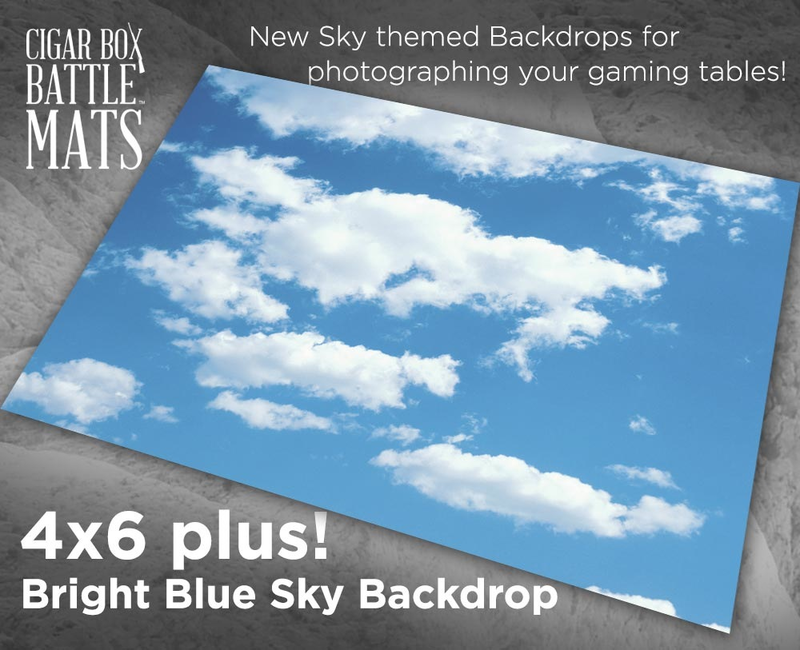 Well, Cigar Box Battles have just released two new mats which are aimed to be used as backdrops for your games. The first is their Bright Blue Sky mat, suitable for just about anything. The second is a Blood Red Sky mat, which is probably far more suitable for sci-fi and fantasy games. Both mats should give a great background to your game table photos. They are priced at $55, which might seem a lot of money to part with, just to get some pretty pictures, but what price art, eh? It’s a great idea – especially if you fancy taking some great looking photos of your games that really look the part. My only thought is that 4′ x 6′ does seem a little bit of overkill for the size of mat you would require. Unless you are using some really big buildings or models, I would have thought that a backdrop somewhere between 2′ or 3′ high would have been quite sufficient. 2 Comments on Are Cigar Box Battles UK rock music fans? Tubular Bells for the sky one….not sure about the other, bit like a Rainbow one I think – its not Alice Cooper though! I agree about the size. I would cut the back drop to give a 2′ x 6′ and a 2′ x 4′ for two of the sides.